I've been making fiber batts to use in the studio, and for the open house that is coming up - weekend of November 17th. Here's a sampling of what I've been doing. 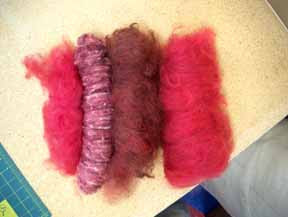 Left to Right Ingeo Fibers, Silk Noil, Lincoln (grey overdyed with red acid dyes) and Domestic wool blended with ingeo and angelina fibers.